PowerRun enables you to open Cmd.exe, regedit.exe and other software with enhanced privileges on par with TrustedInstaller. There are instances that even when you are running as an Administrator, it is just not enough to get the job at hand completed. Like when a registry key or file is locked and unable to be edited. PowerRun is designed to overcome these issues allowing you to accomplish the task at hand. It is portable so you can cart this power around for use any time an issue arises. Yo can access locked registries or files that cannot be edited despite the fact that you have Administrator privileges using this simple and straightforward tool. 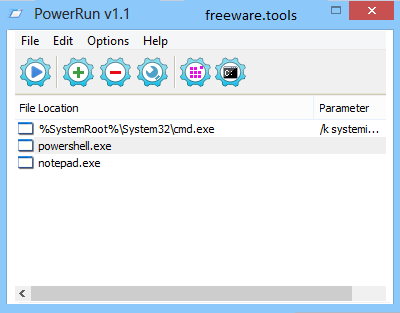 PowerRun is a lightweight piece of software designed for power users who want to access files they normally cannot, although they operating the computer as Administrator. The application does not require setup per se, but rather you can unpack it in any desired location on your local drives. The interface consists of a single window that is fairly appealing and quite intuitive. You will be happy to learn that the utility includes quick links to handy tools that you are likely to use as admin, namely Regedit and Windows' command console. While initially the application includes only a few quick access shortcuts – notepad, PowerShell and the CMD console – you should bear in mind that you can add any process that you need to monitor without too much hassle. You can add a process by specifying the file location, its working directory, the parameter if required and the preferred Windows Startup state. Alternatively, you can drag and drop files directly in the dedicated window. The idea behind the application is to permit you to open, edit and run files with the highest privileges that go beyond that of the administrator rights. As you probably know, there are times when you are still unable to access or edit registry keys because they are protected by the system from accidental deletion. In addition to manipulating registry keys, the utility also enables you to access other hidden account and levels on the system that are blocked from the standard admin privileges. In case you stumble across such a registry key, then you can open it using the dedicated Launch Registry Editor. If you prefer to get things done faster, then you should know that the app enables you to create VBS or BAT files with the necessary parameters to automate the entire process. In the eventuality that you are having a hard time accessing registry keys or other files in spite of the fact that you have Administrator rights, then perhaps PowerRun could come in handy.